In a post a couple of weeks ago – COuRsE Data – I highlighted several example questions that might usefully be asked of course data, thinks like “which modules are associated with any particular qualification?” or “which modules deliver which qualification level learning outcomes?”. 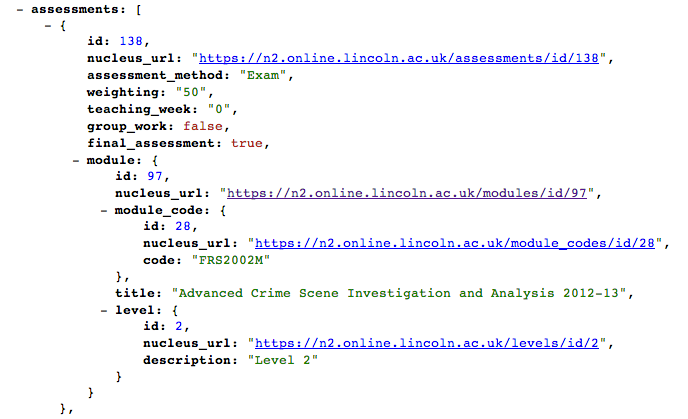 As the University of Lincoln ONCourse project comes to an end [disclosure: I am contracted on the project to do some evaluation], I thought it might be interesting to explore the API that’s been produced to see just what sorts of question we might be able to ask, out of the can. So what’s available? 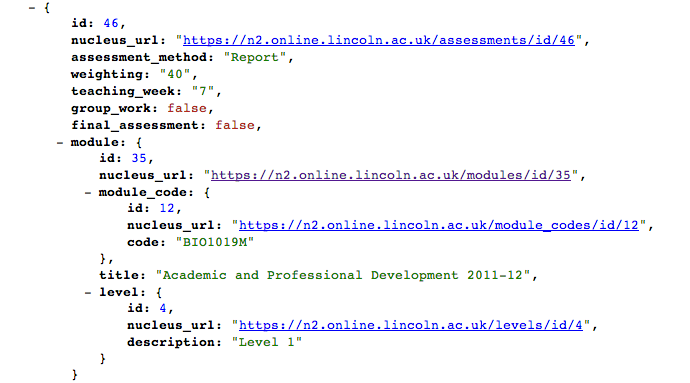 A quick skim of the Objects returned via the API turns up some potentially interesting sounding ones in a course data context, such as: Accrediting Body, Assessment, Contact Type and Time, Course Code, Delivery Mode, Learning Outcome, Module Code, Programme Outcome. So let’s just pick one and see how far we can get… We can start at the bottom maybe, which is presumably Module. Looking at the record for an actual module gives us a wealth of data, including: the module code, level and number of credit points; a synopsis and marketing synopsis; an outline syllabus (unstructured text, which could cause layout problems? ); the learning and teaching strategy and assessment strategy; a set of module links to programmes the module is associated with, along with core programme data; a breakdown of contact time and assessments; and prerequisites, co-requisites and excluded combinations. #Can I look up the programmes associated with a module given its ID? #When was a module presented? One thing I’m not sure about is the way in to a moduleID in the first instance? For example, I’d like to be able to straightforwardly be able to get the IDs for any upcoming presentations of FRS2002M in the current academic year? Philosophically, I’m not sure about this? I know that assessment is supposed to be tied back to LOs, and quality assurance around a course and its assessment is typically a driver for the use of LOs. But if we can only find the learning outcomes associated with a module via its assessment..? Hmmm… Data modeling is often fraught with philosophical problems, and I think is is one such case? 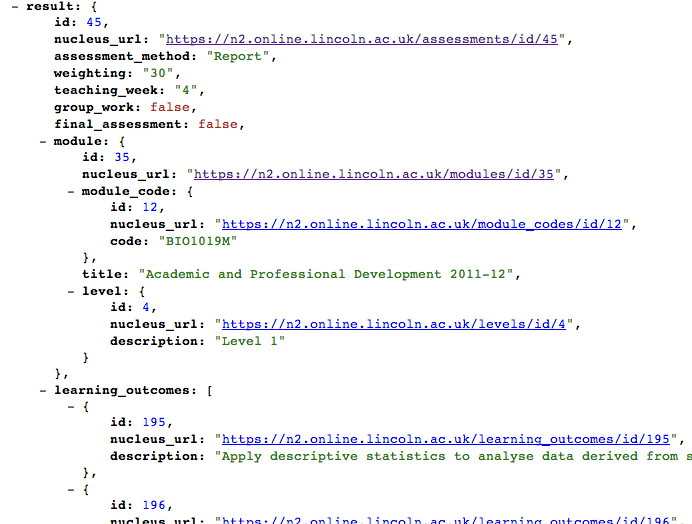 We can also query the API to get a list of learning outcomes directly, and this turns up a list of assessments as well as the single (?) module associated with the learning outcome. Does this mean that a particular learning outcome can’t be associated with two modules? I’m not sure that’s right? Presumably, database access would allow us to query learning outcomes by moduleID? Okay – that’s probably enough for now. The API seems to be easy enough to use, and I guess it wouldn’t be too hard to come up with some Google Spreadsheet formulae to demonstrate how they could be used to pull the course data into that sort of workspace (eg along the lines of Using Data From Linked Data Datastores the Easy Way (i.e. in a spreadsheet, via a formula)). Looking at some of the API calls, it would be generally useful to have something along the lines of offset=N to skip the first N results, as well as returning “total-Results=” in the response. Some APIs provide helper data along the lines of “next:” where eg next=offset+num_results that can be plugged in as the offset in the next call if you want to roll your own paging. (This may be in the API, but I didn’t spot it?). When scripting this, care just needs be taken to check that a fence post error doesn’t sneak in. Thanks, Tony. That’s some useful early feedback which we’ll respond to.